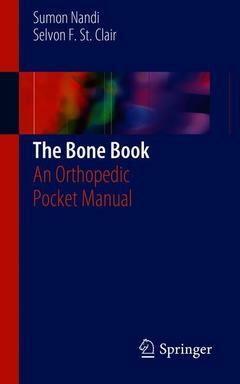 The Bone Book Nandi Sumon, St. Clair Selvon F.
Authors: Nandi Sumon, St. Clair Selvon F.
Add to cart the livre of Nandi Sumon, St. Clair Selvon F.
The Bone Book: An Orthopedic Manual is a complete guide to the essentials of orthopedics in today's busy hospital setting. Concise chapters provide the basic knowledge that all orthopedic surgery residents, fellows, and supporting staff must know to handle the full range of conditions, injuries, and diseases for patients in the operating and emergency room settings. Included are essentials of musculoskeletal anatomy, physical examination, orthopedic emergencies, and ER consults, including care for fractures, dislocations, bone/joint infections, and spinal cord injuries. Additional chapters cover OR basics, such as patient positioning, prepping, and draping, and common orthopedic techniques, such as splinting, joint aspiration, and regional blocks. By compiling information commonly passed down from senior to junior surgeon, the authors have distilled a wide range of orthopedic fundamentals into one easy-to-read book. Anatomy Essentials.- Physical Exam Fundamentals.- Managing the Floor.- Orthopedic Emergencies.- Emergency Room Consults.- Sports Injuries.- Basics.- Techniques in Orthopedics.